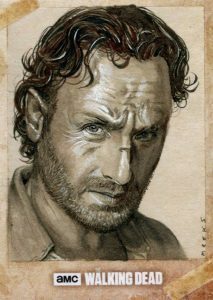 Continuing to cover the saga that is The Walking Dead, 2017 Topps Walking Dead Season 6 picks up where Season 5 left off. Hobby boxes again promise a pair of hits but at least one is guaranteed to be an autograph. 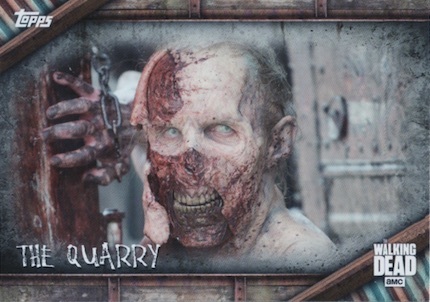 The 100-card base set documents the entirety of the season with footage from the show. Unique parallels put a TWD spin on the base cards with Rust (1 per pack), Mud (#/50), Mold (#/25), Sepia (#/10), Blood (1/1) and Printing Plates (1/1). 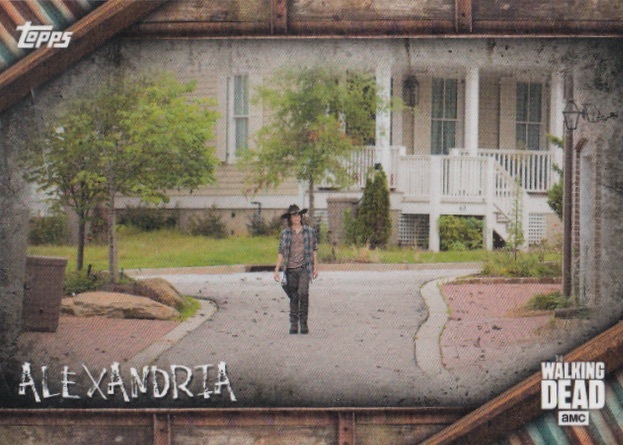 2017 Topps Walking Dead Season 6 also offers several inserts. This includes Character cards and a Walkers insert. 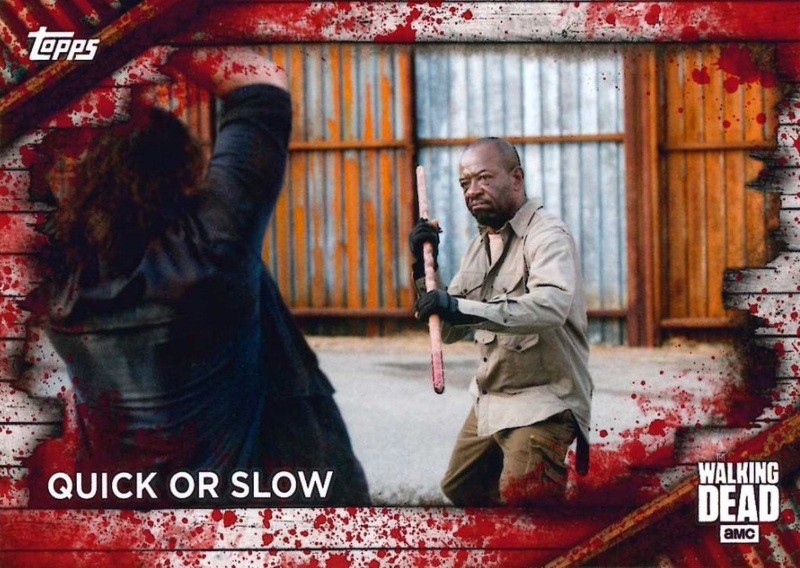 Chop, a familiar sight on The Walking Dead: Card Trader app, makes its physical debut. All inserts have Rust (#/99), Mud (#/50), Mold (#/25), Sepia (#/10), Blood (1/1) and Printing Plate (1/1) parallels. 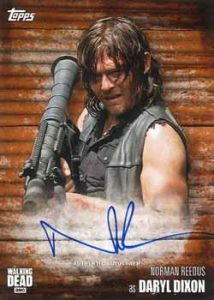 Covering most of the key names from the season, including Jeffrey Dean Morgan and Norman Reedus, the Autograph insert comes in a base version as well as Rust (#/99), Mud (#/50), Mold (#/25), Sepia (#/10), Blood (1/1) and Printing Plates (1/1). There are also Dual Autograph and Triple Autograph options with new Blood (1/1) parallels. Another debut is the Autograph Relic insert. 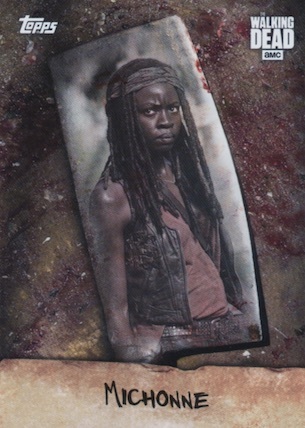 Other premium choices in 2017 Topps Walking Dead Season 6 are Relic cards, with parallels, and Sketch cards. 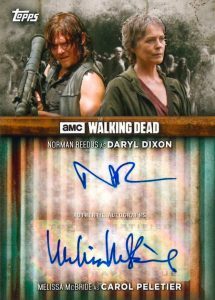 TOPPS WALKING DEAD SEASON 6 MICHAEL CUDLITZ ABRAHAM AUTOGRAPH CARD RUST # 99! 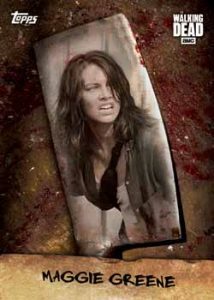 PARALLEL CARDS: Rust (1 per pack), Mud #/50, Mold #/25, Sepia #/10, Blood 1/1, Printing Plates 1/1. 39 "Dolor Hic Tibi Proderit Olim"
5 cards. Serial numbered. Shop on eBay. 9 cards. Target only. Shop on eBay. PARALLEL CARDS: Mold #/25, Sepia #/10, Blood 1/1. 9 cards.Walmart only. Shop on eBay. No card listed for #F-9. 83 artists. Shop on eBay. 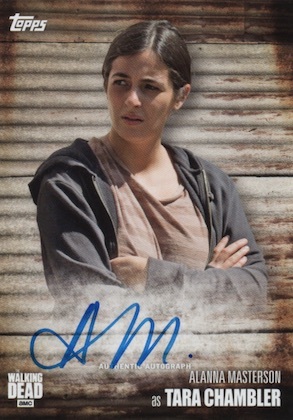 Good: Main autograph set is on-card, multiple inserts available, strong retail component. Bad: Many things blend together and too few cards stand out, main parallels (I’m looking at you, rust) feel too plentiful without adding much. 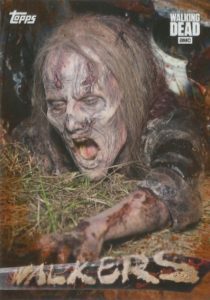 The Bottom Line: Gone are the days when TWD sets were split into two releases per season but there is still a separation of sorts, as retail exclusives are ramped up for Season 6. 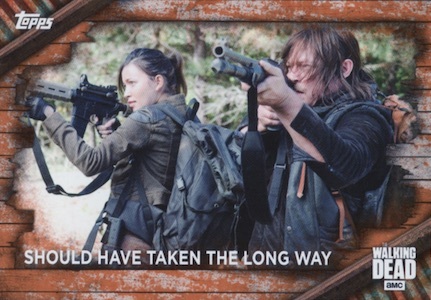 The repetitious nature of the sets combined with designs that are okay but not memorable, means that 2017 Topps Walking Dead Season 6 might not produce huge excitement unless you are a die-hard fan. Going with lots of dark colors and industrial designs, the look certainly fits the mood of the show but it also struggles to stand out to my eyes. This is also the case since many of the inserts are carried over from the prior season along with the less-than-exciting parallels. I personally think it’s overkill to apply the full parallel assortment to the inserts. Even the new inserts aren’t really "new" from a design perspective. Chop is from the digital app while Target-exclusive In Memoriam was originally an on-demand release that only lasted two cards. At face value, I do like the creativity of Chop and enjoy the unique way it highlights the characters. While they don’t come in hobby, the white-heavy scheme of the In Memoriam cards is a welcome addition of brightness. 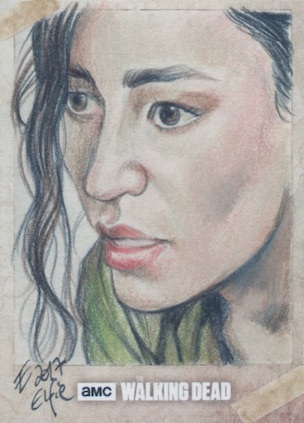 I also am glad to see on-card autographs, which are an expectation in entertainment sets, but I would like that to be applied to the Dual/Triple Autographs and Autograph Relics inserts, as well. Normally, the more appealing thing about non-sport sets is that the checklist is much tighter than the sports options. In this instance, collectors know that they will likely pull an autograph in a hobby box that will come from a list of only 17 names. While the lack of base numbering muddies the waters, so to speak, you at least have a better idea of what to expect. Although retail collectors likely appreciate the exclusive options available to them, it does split the release up a bit. That can be good or bad depending on what side you are sitting on. Making the Negan (and Walker) relics exclusive to Walmart is something that slightly downgrades the hobby checklist. As a side note, the Walmart blasters also guarantee one hit per box. Based on the odds, most hobby boxes should deliver an on-card autograph along with a relic card or sketch. This is a solid haul but it still can be difficult to overcome the current hobby box price of $85+. Pulling a full base set helps. Because many of the signers are repeats from earlier sets, values aren’t quite as strong. 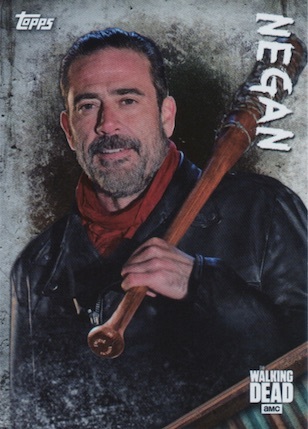 Really only Jeffrey Dean Morgan as Negan is a "big" option. While they are extremely rare, the Autographed Costume Relic do give value a slight bump. Without really anything to catch my attention from a design perspective, the excitement of the set mainly came from the hits. This included a hard-signed autograph and a quality sketch. Both of these can help make a box fun, and they did for me. I was still left feeling like there should have been something more. Topps did a great job mirroring the feel of the show in card form, but cards still need that eye appeal or creativity to really stand out. 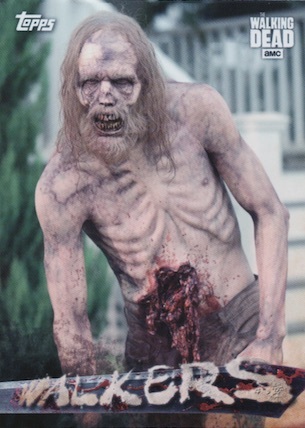 Maybe acetate Walker cards or the Chop with a foil blade would spice it up. Just FYI – there are ten (10) Ties That Bind insert cards. Carl and Enid are no. F-10, no sight of F-9 yet. Numbering error by Topps? 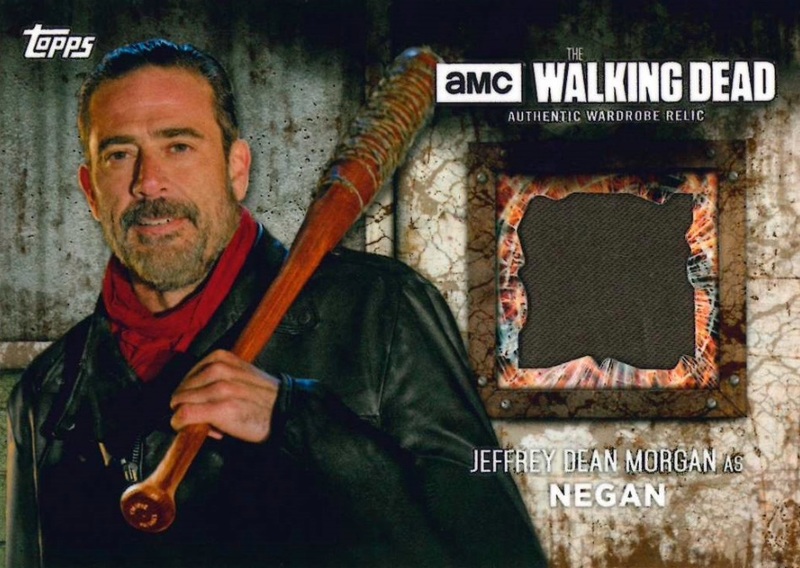 I pulled a Negan pants relic from a single Target retail pack. So they are not exclusive to Walmart. Regarding the Wal-Mart exclusivity of Negan by looking at the actual writing in the box it would seem that walker relics and Negan/walker DUAL relics are exclusive..that’s why Negan’s pants were pulled in Target..out of 7 of them that I’ve bought (they only put out 3at a time, seemingly) I haven’t seen a Negan anything..got 2 sepia/10 ccards plus the guaranteed pull packs were /50 in 2 of the first 3 I bought..it’s been bunkness since..